The Friends Store including hours of operation and location. 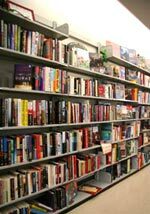 The friends of Jefferson Public Library offers dozens of books at bargain prices for purchase online from our Amazon store. Buying through Amazon is both safe and secure and all profits from sales go to supporting the Jefferson Public Library System by providing unbudgeted items for all of its library branches. Every purchase you make through our store on Amazon not only provides you with a product at excellent prices but also helps to better our libraries throughout the parish.